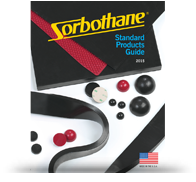 Sorbothane® distributors stock many of the most popular standard products but not all of them. Please check with the distributor listed for the products they carry and availability. Distributing most Sorbothane, Inc. Standard Products. Distributing Sorbothane, Inc. Industrial Stud Mounts. Distributing Many Sorbothane, Inc. Standard Products. Distributing Shock attenuating Sorbothane® sheet stock. Distributing Vibration isolating feet and sheets for photonics applications. Distributing Most, but not all, Sorbothane, Inc. standard products. Distributing Sorbothane sound damping and isolation products.